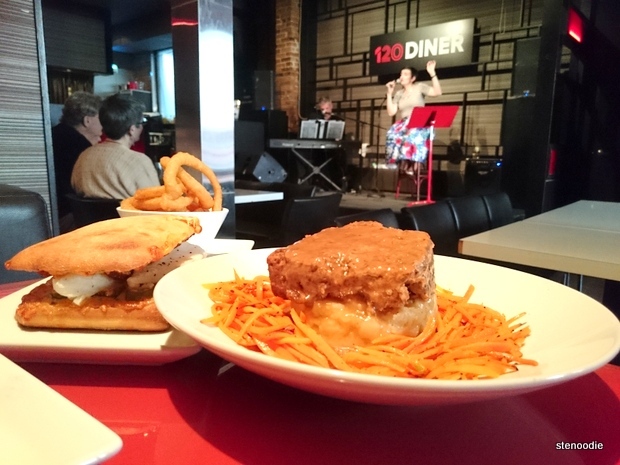 I had the pleasure of being invited to 120 Diner, Toronto’s hot spot for live music, comedy, and comfort food. 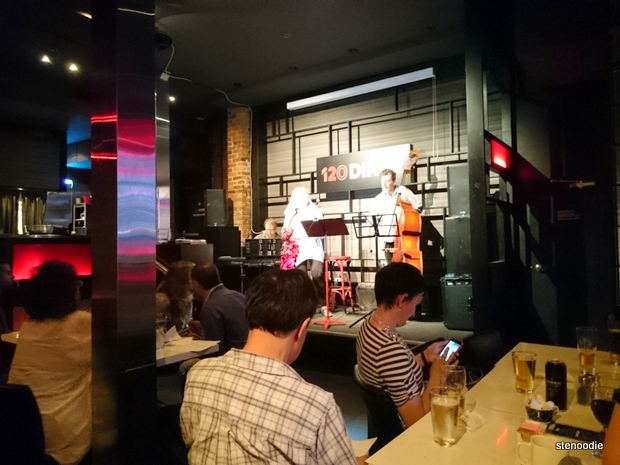 120 Diner was approaching their second anniversary and I was excited to attend as I love intimate dinners that are hosted by the owner (great experience of dining at the restaurant and feeling out their vibe versus tasting events). 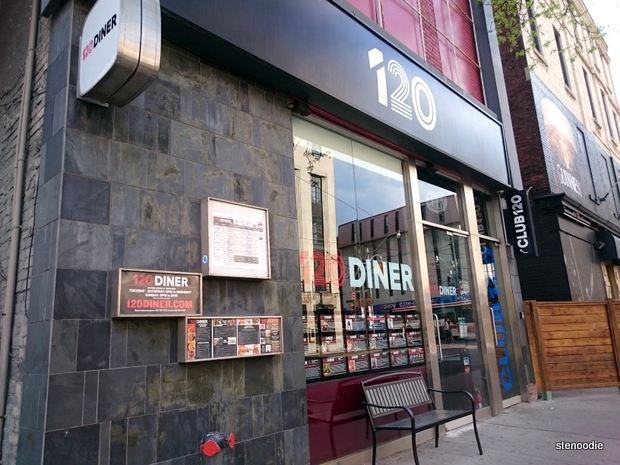 120 Diner is located at 120 Church Street south of Richmond Street East. 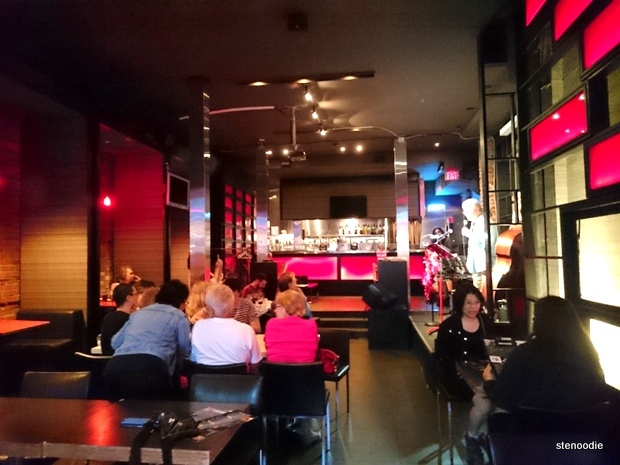 It’s a modest and casual restaurant with booth seats, large tables, and a stage set definitively in the middle of the restaurant. You can’t miss it! If you arrive early, you can definitely take your pick of the tables for a better view and experience from the live shows. Walking into 120 Diner on Wednesday evening, Christine and I took a seat at one of the booths facing the stage. I believe this was one of my first live shows in a restaurant where I was having a meal as well (usually it’s either a sit-down meal or straight concert/show-watching so this was a different and unique experience already). Todd, the one who invited me to his restaurant, introduced himself shortly and he told us we could order anything off the menu to try. 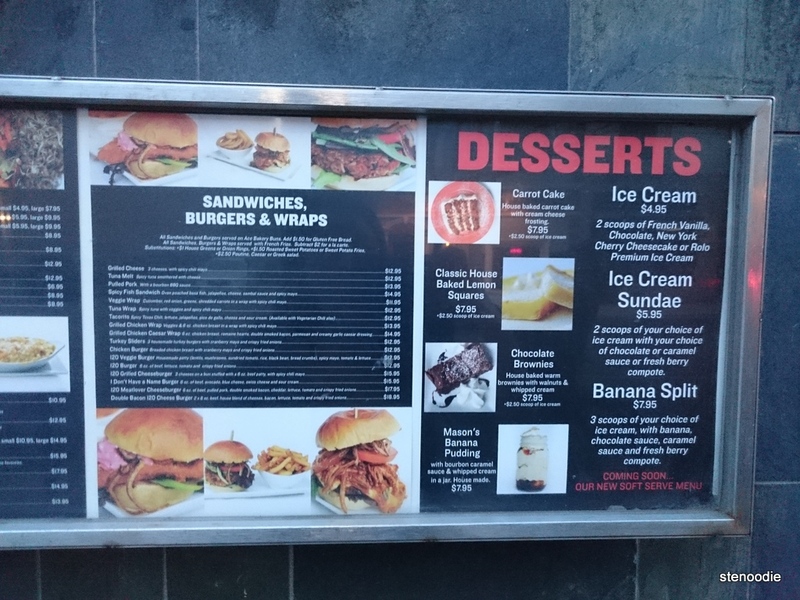 I inquired about the popular and recommended dishes and I took to heart his suggestions and tried four dishes out (a salad, a sandwich, and two mains). 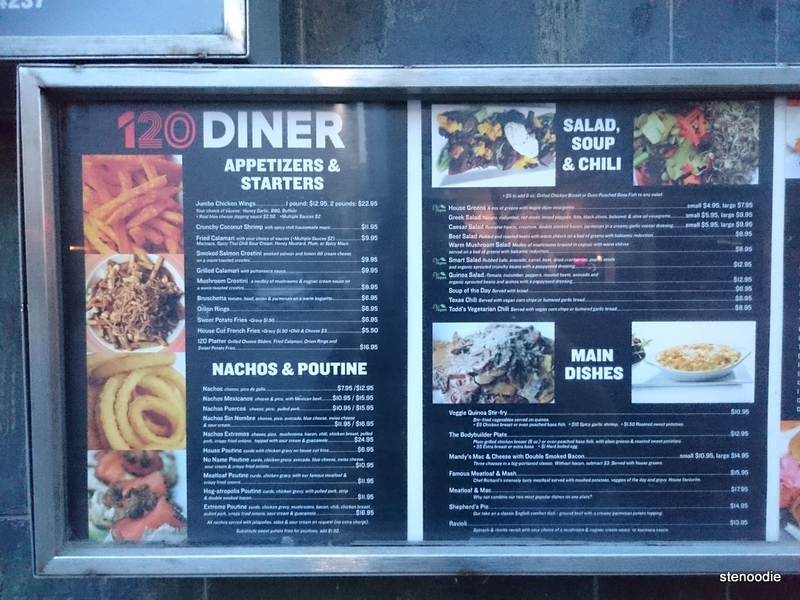 The menu at 120 Diner was extensive including many choices of Poutine, Nachos, Burgers, Sandwiches, Salads, Soups, and other hot dishes. 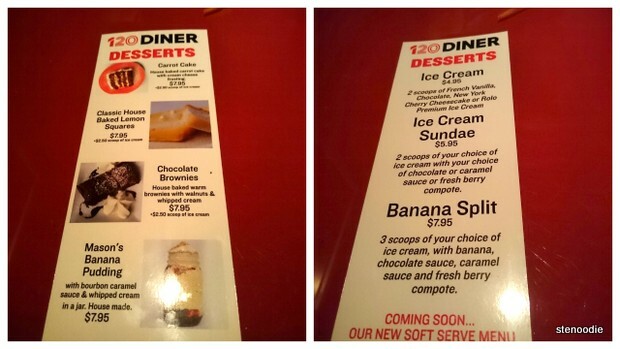 Their menu is so extensive. Lots of great choices! After placing our order, it was past 6 p.m. and the slated show for that time began. On their website, it showed that “Gigi and Friends” were on to play. 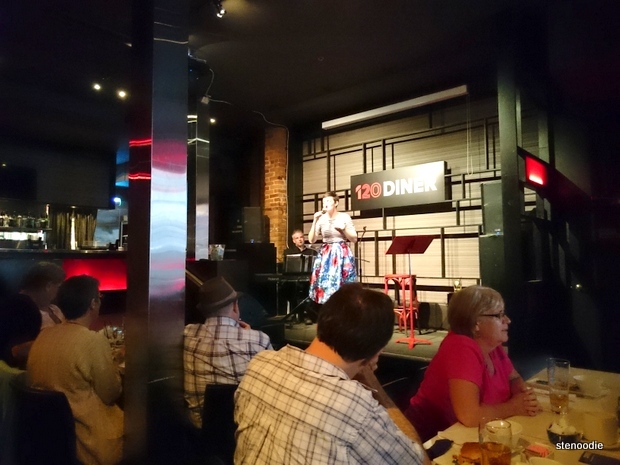 A lady by the name of Geneviève “Gigi” Marentette usually sings onstage with two accompanying musicians every Wednesday from 6-8 p.m. On this night, Whitney Ross-Barris was the one in her place. I found it interesting that in their introduction before she sang, they said (in addition to the normal spiel about enjoying the show) that if the audience needed to talk to someone beside them, they should text each other. Christine and I took it as a joke at that time but as the night wore on, we found out they were not joking at all and took to a silent audience being quite important! 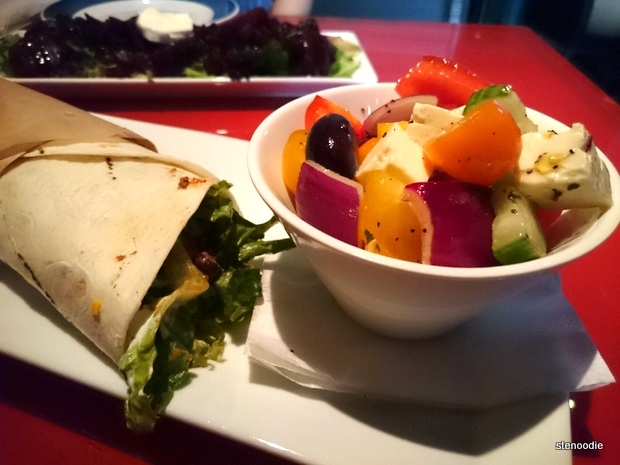 Before long, our first two plates arrived together, the Beet Salad and the Tacorito. 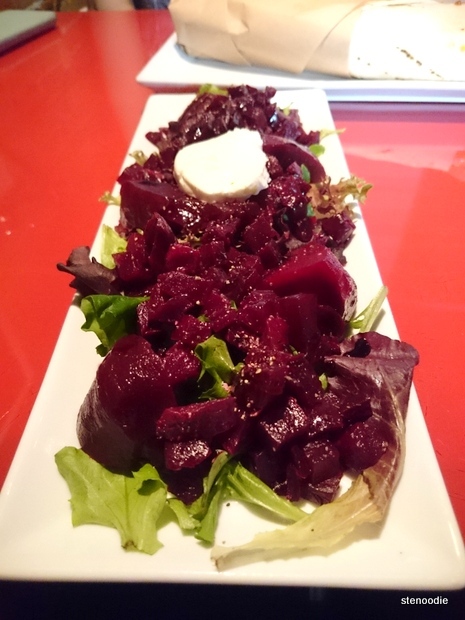 The Beet Salad was made with pickled and roasted beets with warm chèvre on a bed of greens with balsamic reduction. It was an ample portion and the freshly tasting beets were cut up in assorted large and small chunks. I really liked the balsamic reduction which infused into the beets and really gave a tangy sensation. The warm chèvre was essentially goat cheese (I thought it had the texture of feta cheese). 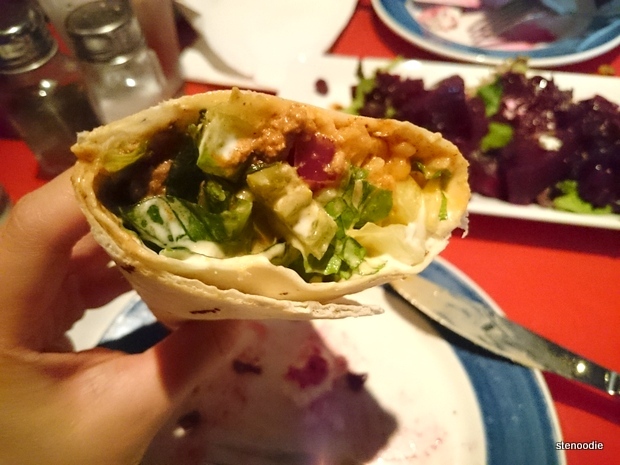 The Tacorito was a big burrito filled with toppings you would usually find in a taco, such as Spicy Texas Chili, lettuce, jalapenos, pico de gallo, cheese, and sour cream. I asked for it to come with a Greek Salad as the side. This picture doesn’t do the Tacorito justice. There was a lot of stuffing inside! I really enjoyed this Tacorito as it was so hearty, filled with lots of toppings, and the Spicy Texas Chili was delicious. It was like eating a mixture of chili in a burrito plus taco toppings. It was so good! 🙂 It wasn’t too spicy either despite the “Spicy Texas Chili”. It was a large portion too and I’m glad we shared it. 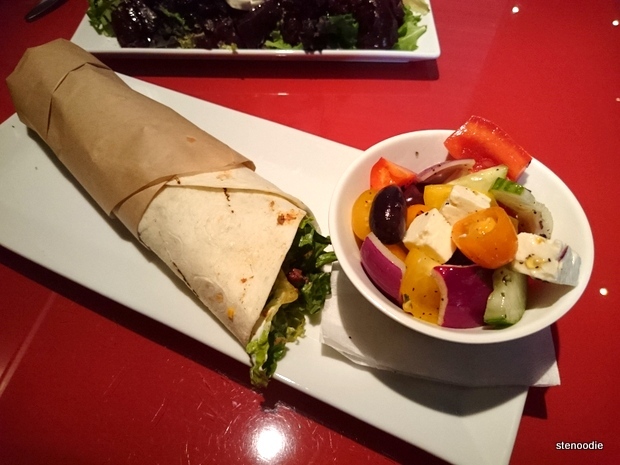 The Greek Salad contained a variety of tomato, cucumber, red onion, mixed peppers, feta, black olives, balsamic, and olive oil vinaigrette. It was good! During this time while we were enjoying our food, Christine and I were catching up and chatting. Unfortunately, due to “Gigi and Friends” playing on stage and their “friendly suggestion” of “no talking”, this was not a good mix for everybody. Someone, another customer, actually came up to our booth and told us to shut up — essentially lol. Christine told me she said something along the lines of “be quiet” and “there’s a live show going on if you haven’t noticed”. Wow! We were certainly taken back by this fellow customer and definitely ate without talking and listened to Whitney sing for the next couple of minutes.. However, we were really here for the food and environment; not so much to sit and listen, so afterwards, as more people filled the restaurant and there was more people whispering to each other, we did too. However, during the night, you could frequently hear people audibly “shushing” people to reduce the noise level and to re-focus people’s attentions to the ones performing on the stage. It was quite a different experience and awesome to be able to see how these places are like. Next up, two more of our dishes came. We had ordered their Famous Meatloaf and their Spicy Fish Sandwich. It was very considerate of Todd to have two dishes arrive first before the other two so we could enjoy everything straight from the kitchen and not have it get cold. 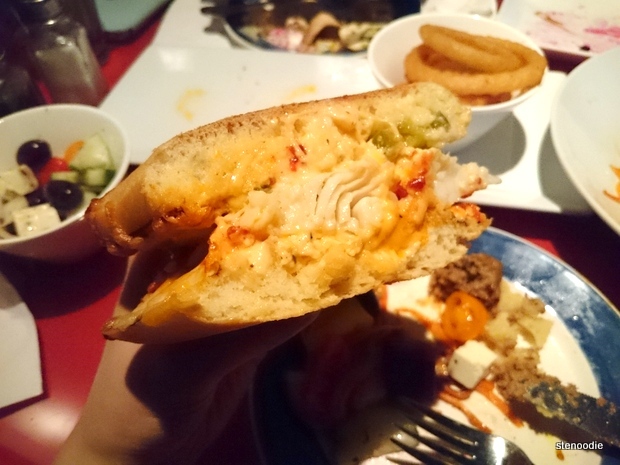 The Spicy Fish Sandwich had an oven-poached basa fish between two layers of bread with jalapenos, cheese, sambal sauce, and spicy mayo. This came with an order of onion rings (you can choose different sides like sweet potato fries, salad, poutine — I actually did want to try their poutine but we had already ordered an incredible assortment of food). The Spicy Fish Sandwich was absolutely delicious!!! The oven-poached basa fish was so tender, so soft, and not rich in flavour that it paired perfectly with the gooey melted cheese, and the spiciness of the jalapeños and spicy mayo. I really, really adored this sandwich! 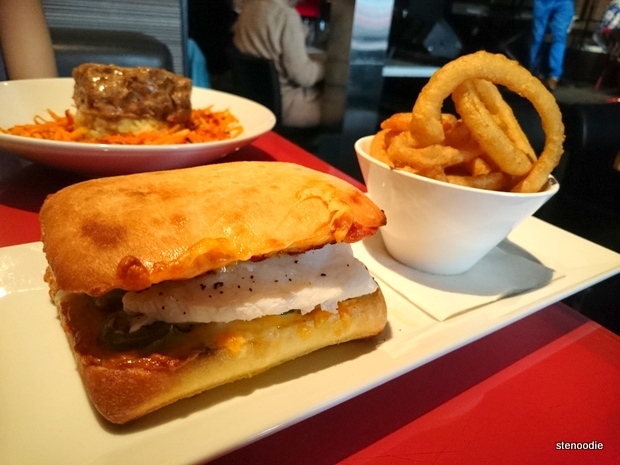 If anything, you must try this sandwich here at 120 Diner. Look at that sauce with the fish! Best fish sandwich! I liked the onion rings as well. The batter wasn’t thick and the rings were crunchy. The actual taste of the batter on the rings was good too; not too salty and not bland either. Yum! 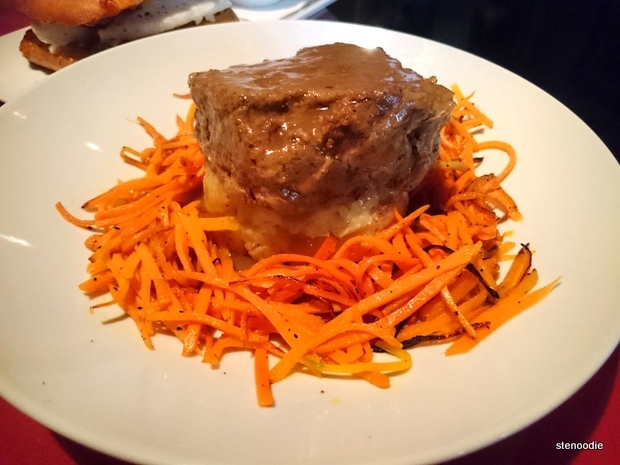 Last but not least, the Famous Meatloaf & Mash was Chef Richard’s “intensely tasty meatloaf served with mashed potatoes, veggies of the day, and gravy”. The veggies of the day turned out to be carrots so it was piled around the plate surrounding the meatloaf and mashed potatoes ‘tower’. This meatloaf was so soft, unlike most meatloaf I’ve had in the past. It was definitely rich in flavour though. The mashed potatoes had a similar grainy texture with the meatloaf. This was definitely a comfort food dish; no frills and a basic comforting meatloaf (I think greatly appropriate for a cold winter’s day too). By now, we had perfected speaking in soft tones despite the live performance. 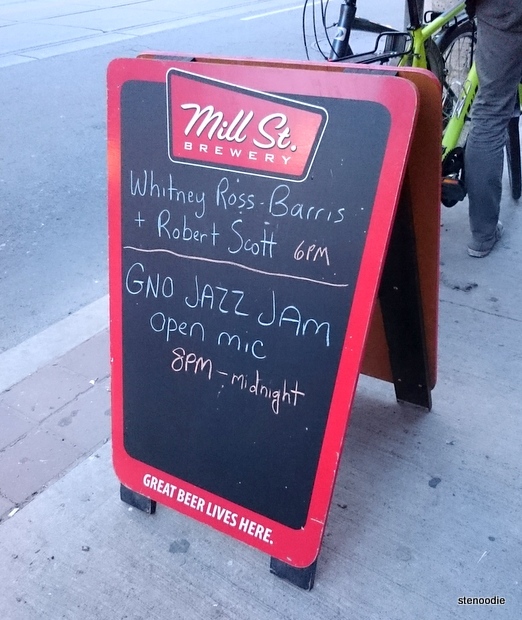 By 8:20 p.m., the GNO Jazz Jam had commenced whereby many enthusiastic talented individuals took turns with the open mic gracing the stage with their great-sounding tunes and melodies. These guys were all really talented! We were quite full at this point and even contemplated ordering dessert or not. However, both the server and Todd were fine with us taking home any leftovers if we couldn’t finish. Thus, we ordered the Classic House Baked Lemon Squares and Carrot Cake. 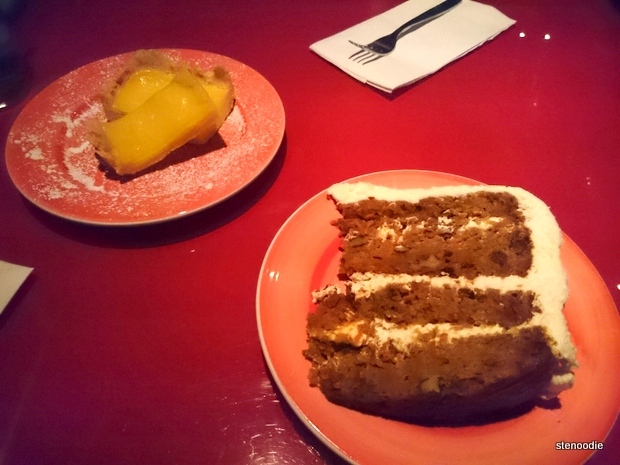 The Carrot Cake was definitely as large as the server said it would be. 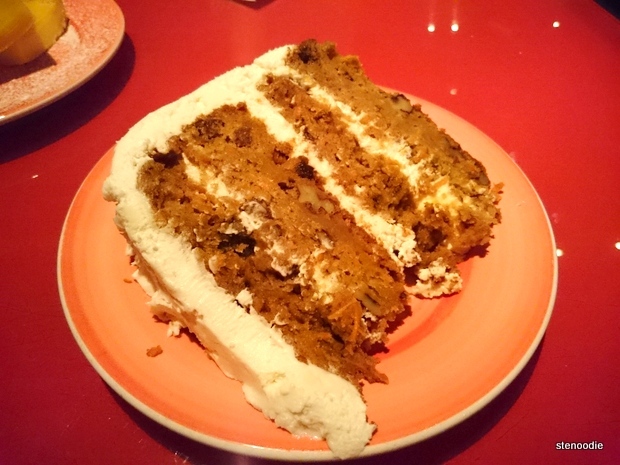 It was a house-baked carrot cake with cream cheese frosting and one slice covered the entire area of a serving plate! There were various nuts and raisins baked into the carrot cake which gave it a lot of texture and made it not very sweet. The cream cheese frosting went well with the dense carrot cake! The Classic House Baked Lemon Squares were also house baked lemon squares. These were also very dense and definitely sour. I think these would go well with tea during an afternoon pick-me-up. Alas, that was the end of our night at 120 Diner. We could have continued enjoying our stay as the Open Mic Jazz Jam was on until midnight. I really appreciated and enjoyed Todd’s generosity in allowing us to choose whatever we wanted from the menu and in making our stay so pleasant and accommodating. 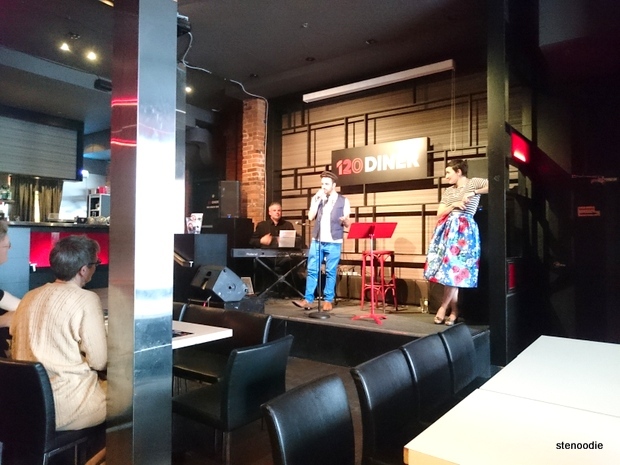 120 Diner is definitely a great spot for live performances for and from the local community. I can’t see too many young people coming here just for the food and shows as the demographic the night we were there showed more of an older audience appreciating live music. I could be wrong though, and I have yet to attend their comedy shows. Nevertheless, the food at 120 Diner was more than decent and a great spot for comfort food with no fancy bells and whistles. A line-up of their jazz & music events in May. You can view their current line-up here. 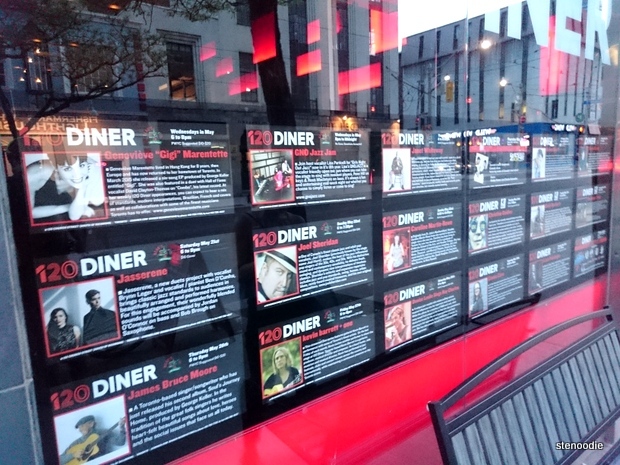 Have you been to 120 Diner before? What was your experience like? Share with me your comments below! 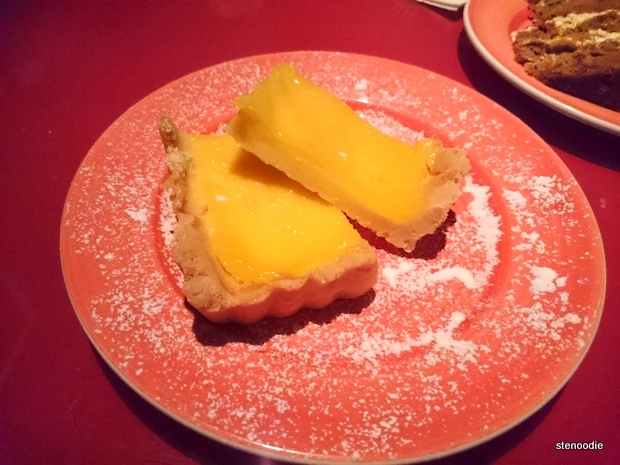 FTC Disclaimer: Although 120 Diner reached out and invited me to a complimentary tasting to review their restaurant, the opinions expressed here represent my own and not those of the restaurant. 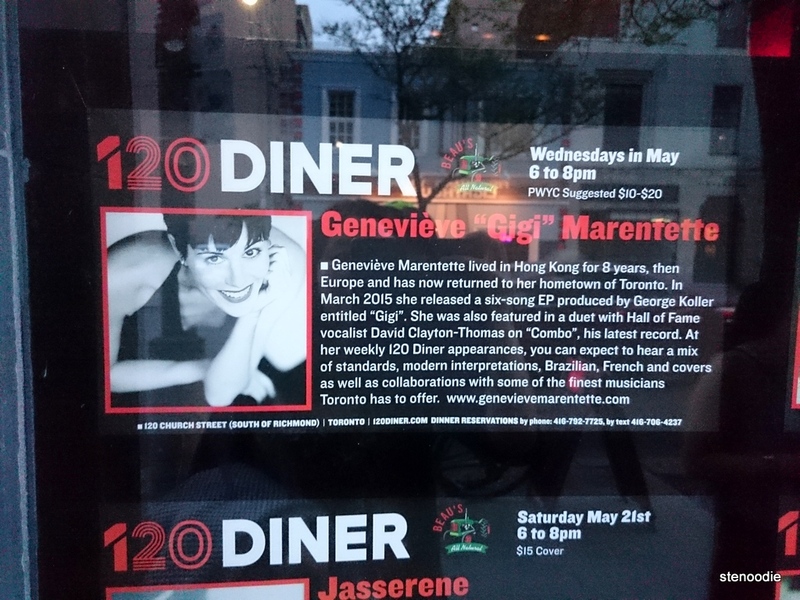 This entry was posted in Complimentary Adventures, Food and tagged 120 Church St, 120 DIner, Beet Salad, Carrot Cake, Classic House Baked Lemon Squares, Famous Meatloaf & Mash, food blog, foodie, Geneviève "Gigi" Marentette, Gigi and Friends performing at 120 Diner, Gigi and Friends show in Toronto, Greek Salad 120 Diner, Live Jazz Comedy and Comfort Food at 120 Diner, live music, open mic jazz jam, restaurant review, restaurant with comedy shows Toronto, restaurant with live performances, restaurants with live music in Toronto, Spicy Fish Sandwich, Tacorito, Toronto. Bookmark the permalink.